It's taken me a while, but I've finally gotten the chance to give the ChiaoGoo interchangeables some attention. ChiaoGoo offers two different interchangeable sets, the Spin (bamboo) and the Twist (metal). Even though my interchangeable hunt started with a focus on wood & bamboo needles, I decided to look at both sets since 1) the pieces are interchangeable between sets and 2) my ultimate winner was a metal needle so I feel it is only fair to review the compara ble ChiaoGoo needle. First off, the Spin. These bamboo needles come with clear nylon cables that swivels. I'm going to say this a lot in this post, but the feel of these reminds me a lot of HiyaHiya bamboos. Those are resin-impregranted and I have to assume these are, too, since they both feel a bit plasticy to me. I have heard some say that KAs feel more plastic-like, but to me KA feel like a smooth, natural wood and ChiaoGoo & HiyaHiya feel more like laminated wood. Naturally, since they are bamboo they are a bit grippy, but no more than my KAs. Bamboo typically has rather dull points, but I've been impressed with the pointiness of the Spins. Mind you, I picked up the ChiaoGoo Twist in a US4, but the point is finer than the KA Switch's point in the same size. I can't really compare them to the sharpness of the HiyaHiya bamboo as I have destashed the ones I got back when and even then I had a US10.5 which will have a larger point no matter what. Personally, I'm not in love with these just because of the feel of the bamboo, but I don't hate them. They are less grippy than the Clover needles I have used and seem only slightly grabbier than, say, a Knit Picks or Knitter's Pride needle. The ChiaoGoo metal needles are the Twist. 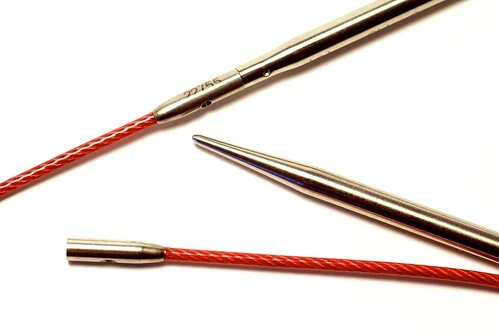 These stainless steel needles have the well-known ChiaoGood red nylon-coated steel cables. Before this, I hadn't been exposed to the ChiaoGoo red cables, though I had heard folks gushing about them. I can see why some people like them - there is zero memory and they have a firmness that would be nice when working on heavier projects - but personally, I'm not a fan. If I were to use the cables as a regular circ, I'd probably be okay, but I rarely do that. These cables make magic looping virtually impossible; the combination of the firmness of the cables and the lack of swivel resulted in such tugging at the loop's cross points that I ended up with ladders. I never have ladders when magic looping! Switching to two circs at a time, I could feel the extra resistance in the cables. It gave a heavier, more weighty feel to my knitting (in a bad way). The resistance wasn't prohibitive to happy knitting, but it's not something I'd want to deal with all the time. We'll call that a personal preference thing. The other mark against these needles is the smell. I'm fairly sensitive to smells and I hate that dirty-metal smell (like the smell your hand gets when you handle a lot of coins). These cables smell like dirty change. Fortunately, the smell never transferred to my hands (a fact to which I credit the nylon coating) and it did fade after a few hours of knitting, but it was still a really distracting (and disconcerting) issue. Yuck. The red cables are a bit of a negative to me, but they don't make me hate the set. If I was really in love with the needles (if I hadn't met HiyaHiya), I could always buy and use the Twist cables. Speaking of which, I do like the fact that the different cables are interchangeable between the sets. 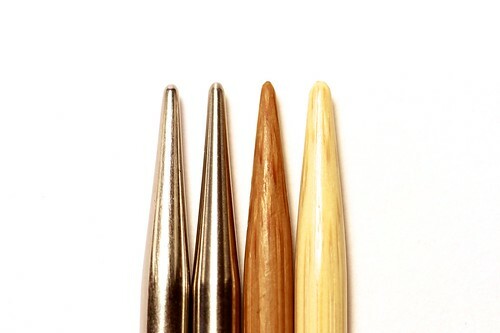 HiyaHiya bamboo and metal sets are interchangeable, but aside from needle materials, the two sets have no differences. I know lifeline holes are a requirement for some but I always end up getting my stitch markers caught unless I put a lifeline in with a needle, so I don't really view them as a positive (or negative). The connector length and slope probably makes the most difference to me since the longer HiyaHiyas seem to feed stitches easier onto the needle. The ChiaoGoos aren't problematic in normal knitting, but I did have some trouble when trying to get overtightened stitches (from a provisional cast on) onto the needle. Bottom line: Both HiyaHiya and ChiaoGoo are good options. HiyaHiya is still my winner but ChiaoGoo are solid-runners up. If the lifeline or nylon-coated steel cable were requirements for me in my what-needle-set-makes-me-happiest search, then ChiaoGoo. But since they are not, they don't. This post is my ChiaoGoo Spin and Twist review! Thanks for your review. This is just what I was looking for!!! Do you know if the Hiya Hiya Cables will work on the Chiaogoo? I just tried it and they do screw into each other but the HH screw is longer than the CG cable so there is about a quarter inch of a join so I don't think it would be very knitting friendly. 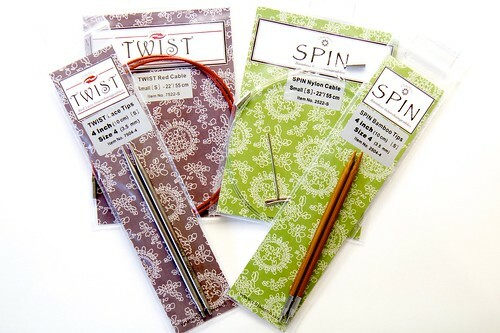 Hi Amanda, Your blog series on interchangeable needles has been really helpful! I'm looking at purchasing a set of metal tips and pretty have it narrowed down to the HiyaHiya 5" sharps. I was looking at the Addi 5" long lace tips but there are too many complaints about the Addi click join. Chiaogoo needles don't seem to have a very big presence in my area. I already like and own some of the fixed HiyaHiya sharp circulars. Can I ask why you chose the 4" sharps instead of the 5"? Hi Kim, glad my interchangeable series has been helpful! As for the 4" vs 5", it's really just a personal preference. The way I hold needles, I end up cupping my left palm around the cable-end of the needle and a 5" needle ends up being so close to my palm that it creates a sharp bend at the join between the needle and the cable. A 4" needle gives me enough room that the needle doesn't hit my palm and the cable doesn't get that sharp bend in it. Of course, I know of other people that hold their needles differently so like having that extra inch of needle to be able to grip and control. So really it all boils down to personal knitting style and comfort. Folks like me that use mostly fingertips when manipulating their needles tend to go for shorter sizes; those that tend to use their palms or all four fingers to direct the needles tend to like longer ones. If you have trouble deciding between a 4" and a 5" needle, I would suggest buying one needle pair of each length in two sizes you use frequently. That way you can compare knitting with the two lengths and, when you settle on your ideal length and get a full set, you'll have an extra needle pair in two of your most used sizes. I have read all parts of the review... But I'm still in doubt - KA, HH or Chiaogoo... 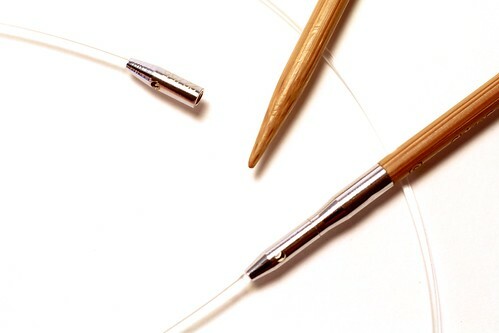 I have knitpro needles now, I prefer wooden needles, and want a rotating wire on my new set.. I have tried comparing but I'm just lost.... And then i wanted to look at lantern Moon and they look so nice, but i can't find any dealers in Denmark! Oh my... What will I do, what should my pick be? If you like your KnitPro, there's no reason to switch. But if you are looking to change, it really depends on what you want. If pointy tips are important, the KAs wouldn't be the best - both HH and CG have pointier bamboo tips. If you knit tightly, I'd suggest the HH because it had a longer transition section between the cables and full size needle section, making it easier for tight stitches to ramp up. If you want the longest needle possible or hold your needles far back from the tip, go for the CG as their shorter ramp up section means they have a longer section of the needle that is the full size. Unfortunately I don't know anything about the Lantern Moon as I couldn't get individual pieces (which is very important to me so I can replace things if I break or lose them - which I've managed to do in both my HH and KA sets). Maybe you can connect with some local knitters on Ravelry and see if you can try out their needles? Because no matter how good a set is, if they don't work with your knitting style, they aren't your perfect needles! Thank you for ansvwering... Well I do knit tightly.. And pointy tips do have importance. But all my research has made me want the impossible - ebony tips, rotating wires and flexible wires for magicloop.. If only HH og CG made ivory tips! Lantern Moon is rare in Denmark, so i dont expect anyone within reasonable distance have them.. I guess I'll just have to wait a bit and think... Lantern Moon do sell individual tips now, but the wire is a problem..
Neat! I didn't know Lantern Moon offered individual pieces now - I might have to get one to check it out! I'll admit, since I found my perfect needles, I'm not keeping a close watch on what other companies do. Though I do already have some of the mini tips from CG in sock sizes. They are pretty awesome!